I’ve done hundreds of hematoma blocks of the distal radius but never considered the ankle. This prompted me to review the medical literature and find the best quality published evidence to support this practice. This 2008 prospective RCT from New York City randomised patients with ankle fracture dislocations to either intra-articular block or procedural sedation. 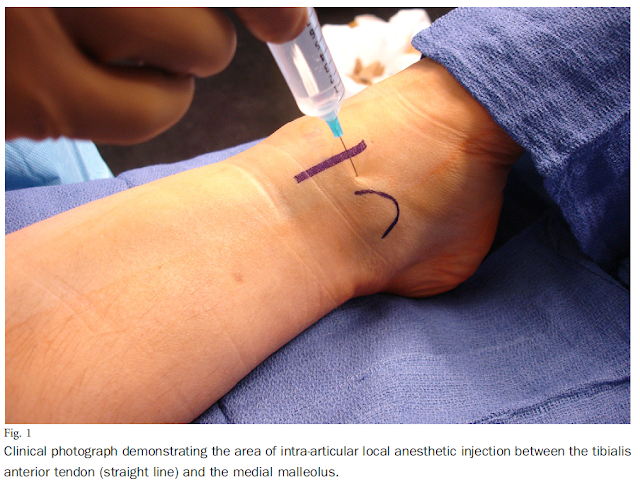 The authors concluded, “…an intra-articular lidocaine block provides a similar degree of analgesia and sufficient analgesia to achieve closed reduction of ankle fracture-dislocations.” In addition, the average time for reduction and stabilization was faster with the hematoma block. So, ankle hematoma blocks are great! They only enrolled 42 patients. Yes, 42… Therefore, high risk for type II error and it cannot make adequate claims about safety. It was sloppy; no specified primary outcome, no power calculation, CONSORT guidelines not followed, no mention of ethical approval, junior orthopaedic residents were “indirectly supervised,” some silly comments about “conscious sedation” etc. So, this is really the best quality evidence we have? However, there is a wealth of published literature on hematoma & intra-articular blocks elsewhere and I think it is reasonable to conclude they are generally safe. Subsequently, I have tried this technique a couple of times and had great outcomes; complete and long-lasting analgesia with wide awake happy patients. All the while not requiring a resuscitation room and all the resources of a procedural sedation. I have an “n” of two. More poor-quality evidence? I would encourage researchers to publish more on ankle hematoma blocks. To be honest, an RCT is probably not necessary to answer this research question. A large prospective case series should be adequate. To read more about ankle hematoma blocks, see paper referenced below. To hear Mike Stone talk about this on the Ultrasound podcast, check the link below and go to about the 11 minute mark.